Summer of ‘76. Sizzling hot, for day after long hot day. Our waterpark, the beck, calls to us. We rush over the path with embedded glass bottle bottoms; down the stone steps cantilevering out of the wall. I eye the wilting watercress with suspicion, remembering the talk of liver fluke, and jump the last step onto the riverbed. The water is lower than yesterday, and the day before. We turn up stream to the bend in the beck. With a joyous One Two Three we slide feet first down the rock, the limestone smoothness slooshing us on our way. A sheep looks up from her munching, puzzled. Later, I float in the natural pool. Steam rises. Evaporites lie fossilised in the rock. One winter, days of rain transform the beck to a swirling torrent. Huge rocks are hurled down the riverbed. Our childhood topography changed forever. 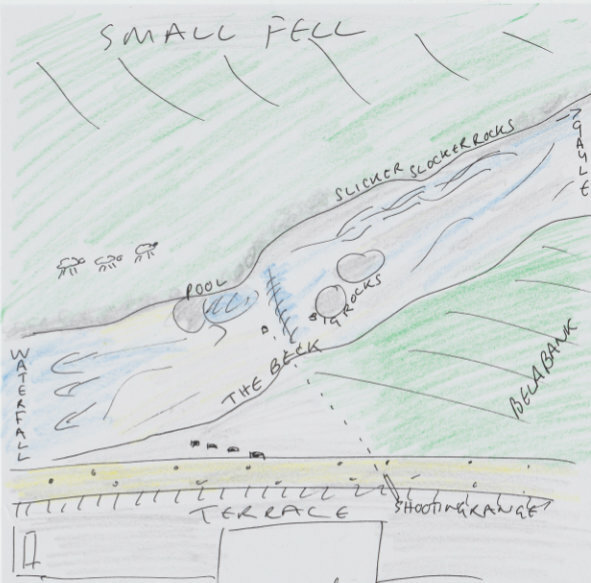 My map is of the landscape outside my grandparents’ house in North Yorkshire. As children, we’d often stay there for holidays, and play in the smooth limestone’s pools and mini-waterfalls, making damns, wading, swimming and sliding. Drawing the map, I also remembered seeing crayfish in a pool, and the time we set up tin cans and shot at them with air rifles. The house is sold now, and my grandparents and father all dead, moved on like those big rocks which were hurled down the riverbed in the flood.